If the Delhi Transport Corporation and the State Transport Authority do not increase the number of their buses, why should we increase capacity for supply? If I order equipment worth several crore rupees without there being adequate number of buses, how would I answer to my superiors?" 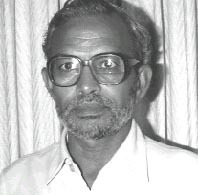 Thus Rajiv Sharma, managing director of Indraprastha Gas Limited (igl). The agency, which comes under the Union ministry of petroleum and natural gas (mpng), is a joint venture of the Bharat Petroleum Corporation Ltd and Gas Authority of India Ltd. It was formed after the July 1998 order of the Supreme Court to set up 80 cng fuel stations in Delhi by March 31, 2000. By February 16, 2001, only 60 such stations have come up. The long queues along cng filling stations are blaring testaments to how igl and mpng have failed to deliver. To give the devil its due, igl has had to contend with agencies infamous for their incompetence, including the Delhi Development Authority (dda), municipal authorities and the Delhi Vidyut Board. An agency created to make cng easily available, igl plans to hike the price of cng . "The price has been increased to over Rs 17 per kg in Mumbai, we still sell it at a little over Rs 11 per kg and incurring losses. Apart from spending huge amounts on setting up cng stations, transportation of natural gas is also very expensive. I have to show profits to my superiors [read mpng ]," whines Sharma. The ministry has no clue about how to use its fuel pricing policy. It plans to discourage a clean fuel like cng , all the while subsidising a dirty fuel like diesel. The real question, however, is: If public sector agencies prioritise financial viability over public interest, what can you expect of manufacturers of polluting vehicles? The answer to this should come from Ram Naik, minister in charge of mpng . Availability of cng does not seem to be a problem. Sharma claims only 62 per cent of the existing filling capacity is being utilised. The dispensers do not fill the gas quickly. igl needs a contingency plan to instal additional boosters and compressors. The import duty of 67 per cent on cng dispensing equipment like compressors is phohibitive, says Sharma. The Union ministry of finance is to blame. Delays in filling cng vehicles have also got to do with the way filling stations have been planned. There are three kinds of the stations. First, there are mother stations, connected directly with the main gas supply line. Second come online stations, which are connected to mother stations through pipelines. And then there are daughter stations, replenished through lorries ferrying cylinders from the mother stations. The villain of this piece is Delhi Traffic Police that fines lorries plying during daytime. Given the inflexible nature of police authorities, the answer is to have more online stations. For that, igl needs land, which places it precariously at the mercy of such bureaucratic bastions as dda . For the long queues outside the filling stations, Sharma blames the archaic nozzles fitted to autorickshaws of Bajaj Auto Ltd that stretch the duration of filling gas and increase in temperature that creates back pressure in the filling pipe. He wants Bajaj to switch to the more recent ngv1 nozzle, which allows faster flow of gas and minimises the problem of back pressure. The ngv 1 nozzle is used all over the world to reduce filling problems and that both types of nozzles cost the same. But Bajaj cannot switch to ngv 1 nozzles due to legal complications. The Bajaj models have been certified with the archaic nozzles. Changing the nozzle would require the company to go through the process of verification all over again with the Union ministry of surface transport, which can beat all the queues outside all the cng filling stations put together when it comes to delays. The only abundant supply of gas comes in the form of lame excuses from igl and mpng . Sadly, these aren't compressed. In complete mockery of its very title, the Union ministry of environment and forests (mef) has shown no interest in pushing for implementation of the cng order despite all the power at its disposal. mef is only too happy with the national emission standards, which are nothing more than the minimum requirement. That more stringent measures are needed in critically polluted areas is completely lost on the ministry's bureaucrats who themselves have no clue about how to control pollution in any city of the country. Existing vehicular emission standards can't rule out the possibility of further tightening in cities like Delhi. Which is why sc has ordered all buses, autorickshaws and taxis to move to cng . The court advanced introduction of Euro i emission norms for Delhi by almost one year in June 1999. Euro ii norms for cars were nowhere in the scene when the court made these mandatory from April 2000. The aim was obvious: push automakers and fuel suppliers to look towards more stringent emission norms with a certain amount of urgency. mef has significant powers under section 5 of the Air Act, 1981, and the Environment (Protection) Act to enforce more stringent standards for pollution hot spots. Apart from once in 1997, when it notified the first ever fuel quality norms, the ministry has never made its presence felt. It has never discouraged dieselisation of the Indian auto sector. There has been no show of commitment or iniative on the part of T R Baalu, the minister of environment and forest. The most glaring testimony to this is the ministry's affidavit filed in sc that opposed the epca recommendation of banning private diesel cars in Delhi. mef stated that diesel cars can't be banned if they meet the currently notified emission norms. The ministry's 1997 white paper on pollution in Delhi is little more than a common position of the all other Union government agencies concerned, such as ministries of industries, surface transport, petroleum and natural gas. It does nothing more to push for cng than propose more cng filling stations -- in typical government tradition of making toothless but politically correct suggestions. It isn't just the ministries that are misinforming the public about cng and ensuring the non-implementation of the Supreme Court order on cng. The Tata Energy Research Institute (teri), a New Delhi-based energy consultancy, has also contributed to such efforts. The teri -industry nexus is strangulating adoption of cng . Despite overwhelming evidence on how cng is far cleaner than diesel, teri has gone to town advocating diesel as the top priority. The institute's newly updated policy paper on technology and policy options for urban bus fleets actually contests the merit of the Supreme Court order on cng . In its report, teri came out in favour of a "fuel neutral approach that preserves the clean diesel option rather than compressed natural gas that is hitting Delhi." This position finds resonance in the position of the all those who have been fighting cng from the beginning -- Union ministry of surface transport, Delhi Transport Corporation and telco , the Tata group company that has the big stakes in diesel. Affidavits filed by telco and dtc in the Supreme Court echo the teri position to continue with diesel. dtc says it can't convert its bus fleet to cng by the March 31, 2001 deadline due to insufficient supply of conversion kits and chasses. The corporation insists on purchasing diesel buses that comply with Euro i emission norms to replace its eight-year-old buses, and new Euro ii -compliant diesel buses. dtc mentions the inclusion of "various other modes of running buses on clean fuels," including low emission fuel efficient diesel engines. telco 's affidavit, too, tries to belittle the problem of particulate pollution in Delhi, claiming that this hasn't reached dangerous levels. In August 1999, a newsletter sponsored by telco tried to discredit the anti-pollution campaign (see 'Diesel update', Down To Earth , August 31, 1999). teri has cited studies of dubious nature to claim that cng vehicles emit more ultrafine particles than diesel ones. But this could not stand to reason in a recent discussion forum on the television channel Star News. teri 's Ranjan K Bose was rendered speechless when Anil Agarwal, chairperson of the Centre for Science and Environment, exposed the true nature of the study from the Harvard Centre for Risk Assessment. Agarwal pointed out that the study was conducted for one of the leading bus and truck engine manufacturers in the us . The report is a literature survey that selectively quotes another study. Baptised as a Harvard study, this report has found way to the table of every policymaker in Delhi. The study has no original findings of its own but is a highly biased literature survey that quotes only studies against cng . Michael Walsh, a highly respected air pollution expert and former official of the us Environment Protection Agency (epa), says, "What I find especially troubling and distasteful is the way the authors give the report the aura of impartiality and scholarship by associating it with the Harvard name. Any undergraduate who turned such a report in to his professor would surely get a very poor grade." teri chooses to ignore the mounting evidence on the cancer causing potential of diesel emissions that is many times more potent than cng emissions. A study by the Swedish consultancy group Ecotraffic found that after taking into account all the toxic components in emissions, the cancer potency level of diesel cars is double that of petrol cars in India. Even more frightening is the fact that if only particulate emissions are compared from different car models then the cancerous effect of diesel particulate matter from the new diesel car is equal to that of 24 new petrol cars and 81 cng cars on the road. The Swedish experts have identified traces of over 40 substances in diesel exhaust that are listed by the epa as hazardous air pollutants and by the California Air Resources Board as toxic air contaminants. Unfortunately, the pro-diesel lobby glibly vouches for diesel without considering how even clean diesel is not good enough to reduce the risk of cancer. When confronted by similar myths being propagated by diesel industry in the us , the us department of energy issued public notification to dispel these myths. It categorically dismissed the argument that cng buses emit more particulate matter or more ultrafine particles than diesel buses: " cng buses consistently emit dramatically less particulate matter than diesel buses. 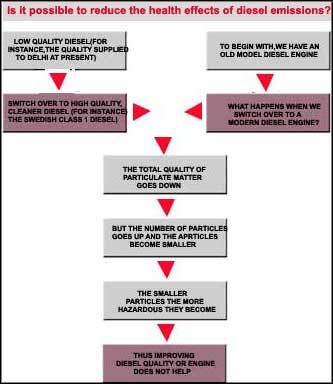 The trace amount of particulate matter associa ted with cng is attributed to crankcase lubri cating oil consumption (which also occurs in diesel engines)" (see graph: Particle toxicity ). As regards the number of ultrafine particles, it says, " cng actually produces much fewer ultrafine particles than diesel fuel." On the point that cng buses cause more global warming, it says, " cng buses have very similar greenhouse gas emissions as diesel buses despite higher methane emissions because natural gas has inherently lower carbon dioxide emissions compared to diesel." However, an issue paper by the European Natural Gas Association points out that "a majority of references conclude that natural gas is most preferable from a global warming point of view (see box: Misleading media and public opinion). teri argues in favour of what it claims are the most cost-effective options for cutting emissions, referring to diesel technologies. In this the institute actually finds support from Ashoke Joshi, secretary to the Union ministry of surface transport, who expressed similar sentiments in a letter dated February 22, 2000, to the Environment Pollution (Prevention and Control) Authority. This was barely one month before the deadline to convert all eight-year-old buses to cng . 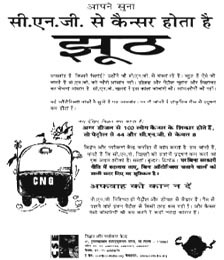 The December 11, 2000 issue of Diesel Fuel News , a pro-diesel newsletter, quotes teri to say that cng technology is not viable for "a poor country like India." So, according to teri , while people are dying due to air pollution, they should wait for the dawn of a cheaper technology. teri not only ignores the health costs of diesel emissions, it also contradicts international experiences of the economic advantages of cng . In another paper dealing with vehicular pollution control strategies, teri champions the cause of promoting alternative fuels like cng . This confused approach shows through. teri ignores a study by the National Institute of Public Finance and Policy that says cng is the most cost-effective option, better than using particulate traps in current diesel buses or bringing advanced diesel buses that would need far cleaner diesel than is available today. The study estimates that the cost (per weighted tonne) of emission reduction with particulate trap 60 times higher than the cost of cng retrofitment.